Proctor & Gamble’s Dawn Ultra, New Zealand Springs. Sold in North America and listed on www.fishpond.co.nz but unavailable in New Zealand. Dishwashing liquid is an environmental hazard. It adds phosphorous to the environment , causes river and lake eutrophication, and contributes to toxic and unsightly algal blooms. The Environmental Working Group lists Dawn Ultra, New Zealand Springs as scoring its lowest possible grade: F – Highest Concern, and warns of “Potentially significant hazards to health or the environment or poor ingredient disclosure“. This doesn’t sound like any NZ spring I’d want to swim in. 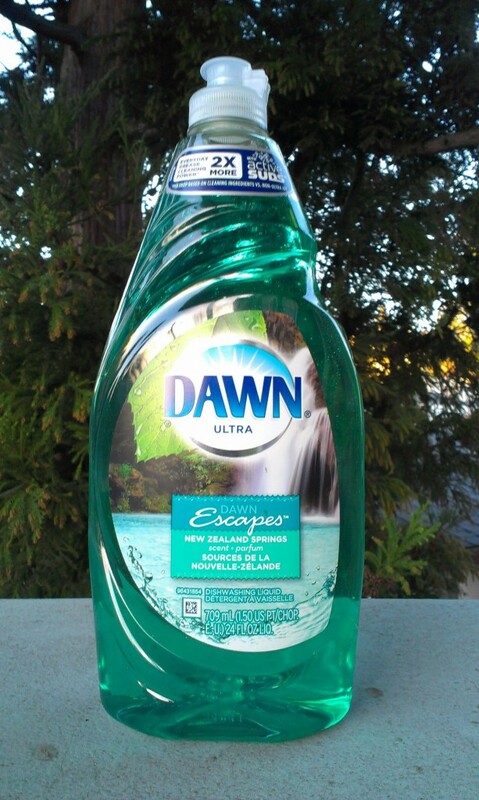 Dawn Ultra, New Zealand Springs isn’t even the least bad of Proctor & Gamble’s dishwashing liquids. It ranks worse than other products in its range, like Dawn Ultra Mountain Spring: “D – Moderate concern: Some potential for hazards to health or the environment. At least some ingredient disclosure”. 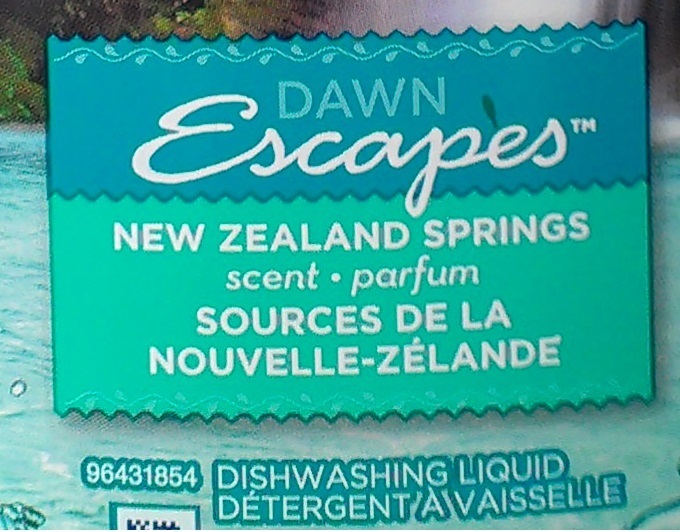 The Environmental Working Group’s main concern about Dawn Utra New Zealand Springs is the “Poor disclosure; May contain ingredients with potential for biodegradation”. The irony for us, and duplicity by corporates like Proctor & Gamble, is the use of New Zealand’s degrading freshwater environment  to sell dishwashing liquid. This is low hanging fruit to an environmentalist. Dawn Ultra is to freshwater springs, what arsenic is to baby food. How stupid does Proctor & Gamble thing we are? But then, perhaps we are that stupid. Clearly the product sells*. More interesting to me, however, is how Dawn Ultra New Zealand Springs illustrates the power of New Zealand’s environment to sell products. It begs the question: Why does our environment not receive a cash injection whenever a business uses it to make money? Natural environments get used for free by businesses to sell products that degrade the environment. How stupid is that? Businesses should pay for using natural environments as promotional tools. Those payments would be invested in natural environment protections. It would be, afterall, for the corporates’ own good – protecting them from themselves by preventing the spoiling of their marketing asset. Corporates should consider payments for such an environmental service an investment. Instead they get a free ride until, of course, the natural environment is natural no more. New Zealand’s Department of Conservation or its Regional Councils should get an environmental payment from Proctor & Gamble for profits made from using New Zealand’s springs to sell detergents. Alternatively, Proctor & Gamble should establish a private freshwater protection fund in New Zealand, least it appear to be exploiting our reputation or misrepresenting our nation’s freshwater assets. I wrote to Proctor & Gamble asking about why they chose New Zealand and our freshwater springs to market their product. My letter and their response form my next post of this series. * Proctor & Gamble’s Dawn Ultra, New Zealand Springs. Sold in North America and listed on www.fishpond.co.nz but unavailable in New Zealand. 1 Comber, S., et al. (2013) Domestic source of phosphorus to sewage treatment works. Environmental Technology 34, 1349-1358.